VICE is excited to celebrate the launch of their Indonesia office with a two-day blowout at Bali's beautiful Potato Head Beach Club Bali. The 'Weekender' party, which runs from July 1st to 2nd, features a diverse setlist of live music and DJ sets by some of the most-exciting acts from across the globe. Join on Saturday July 1st for sets from headliner DJ Harvey (Los Angeles) and Dea (Bali) as well as live music from ISLAND OF THE GODS (Bali) and Zatua (Bali). On Sunday July 2nd, Trevor Jackson (London) headlines with a DJ set after live music from Jogja's rising noise stars Senyawa, Jakarta's disco revivalists Pleasure, and a DJ set from Seabass, Potato Head Beach Club's own artist in residence. Arrive before the sun goes down for free entry and check out an art show and video exhibition of some of VICE's best work all weekend long. 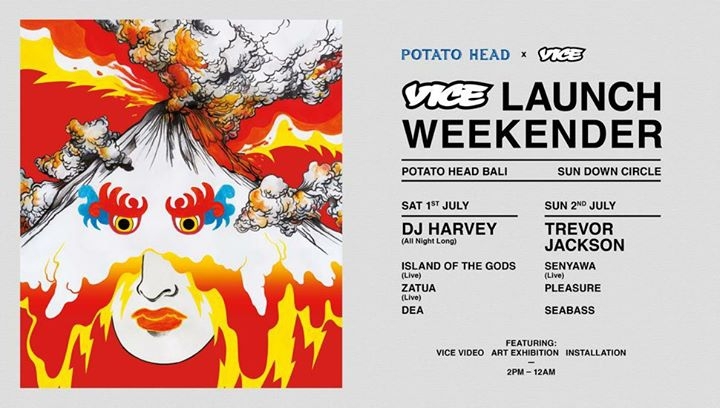 Weekender: brought to you by VICE Indonesia and Potato Head Beach Club.